It seems you can’t go wrong with a slider recipe! I think it’s the toasty bun that’s topped with butter and seasonings, then stuffed with your favorite ingredients. 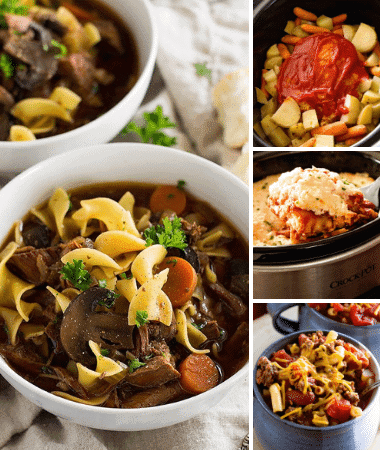 There are so many fun and delicious variations that you can always find one everyone will like. 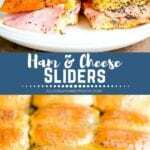 We’ve made Pepperoni Pizza Sliders, Breakfast Sliders and now I’m going to share our all-time favorite Ham and Cheese Sliders with you today! It’s a nostalgic recipe that my mom used to make, and I can’t believe I’ve never shared it with you. 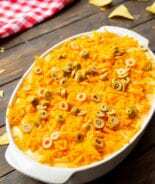 This recipe is the perfect quick and easy appetizer or tailgating recipe for when you are having friends and family over to watch a big game, or to celebrate any occasion. 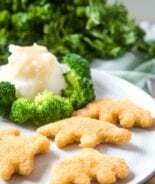 They are always a hit and the kids love them along with the adults! 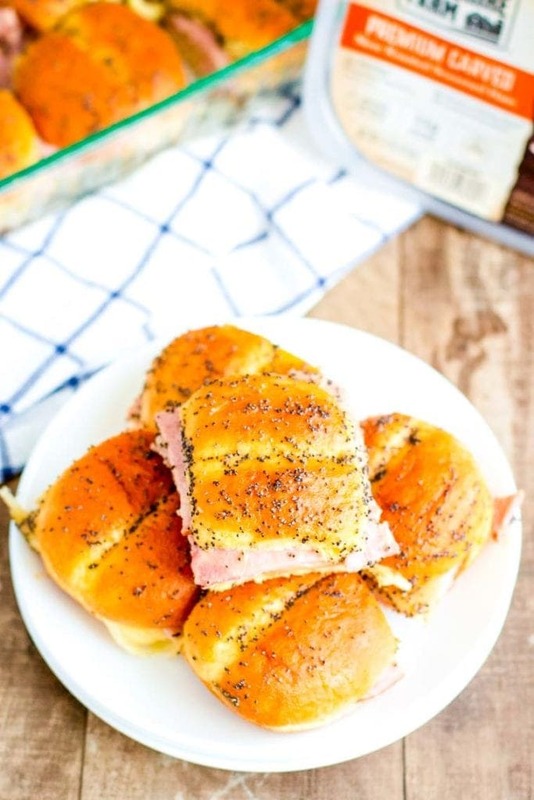 These Ham and Cheese Sliders are layered with Hillshire Farm® Premium Carved Slow Roasted Seasoned Ham and Swiss cheese, then the slider buns are brushed with a delicious, savory, butter sauce that makes the buns nice and toasty on the top, and soft and amazing on the inside. Plus, they are SUPER simple to make. I’m always a fan of easy recipes that taste like a million bucks, and this slider recipe is just that. 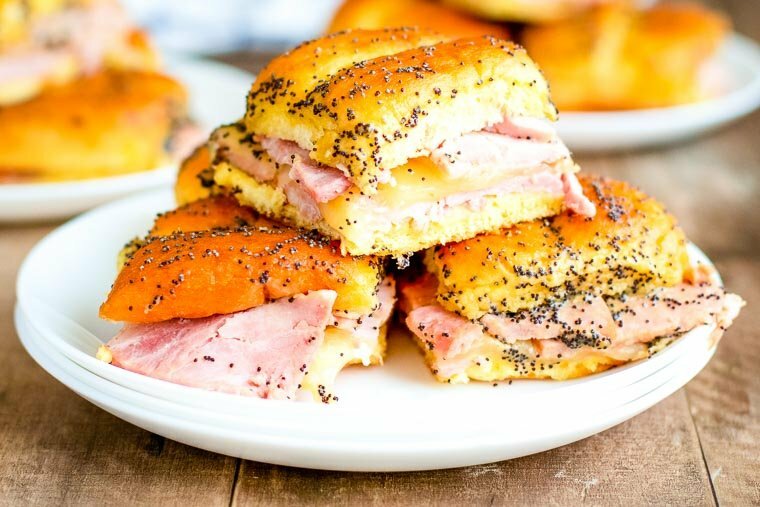 What’s not to love about warm ham, melted cheese, and toasty buns covered in a butter sauce? 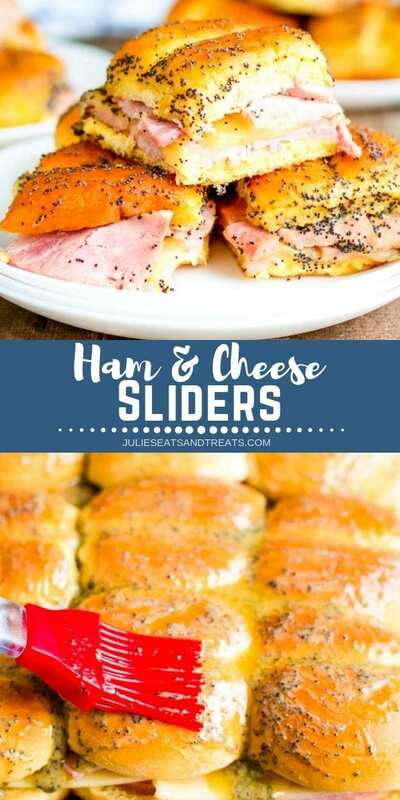 Another thing I love is that these sliders are stuffed with my favorite Hillshire Farm Premium Carved Slow Roasted Seasoned Ham! 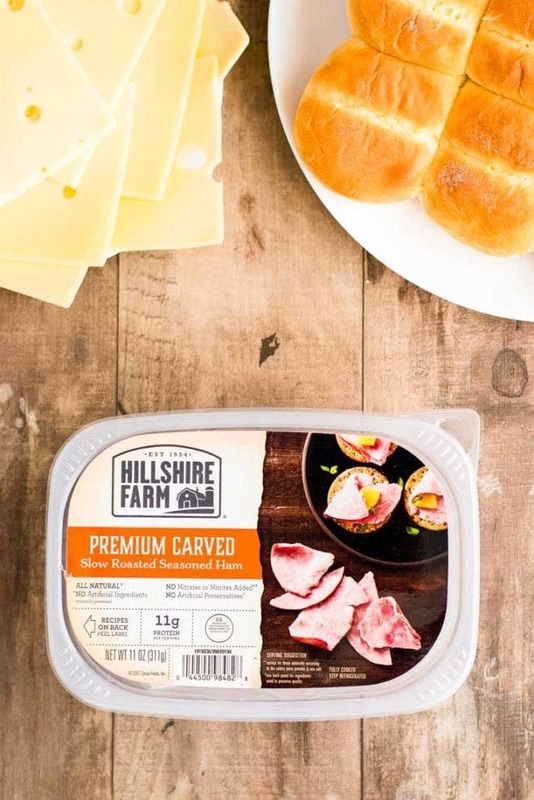 I love it because I know that Hillshire Farm Premium Carved Slow Roasted Seasoned Ham is all natural, premium carved meat, and it has no artificial ingredients, no artificial preservatives, and no nitrites or nitrates added! 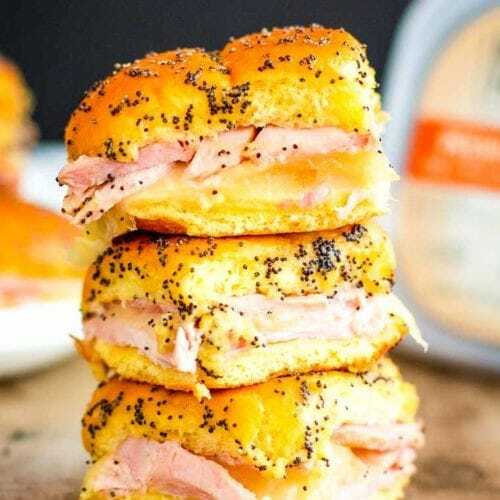 I found it at my local Walmart and it was so easy to get the ingredients to make these Ham and Cheese Sliders because I used Walmart’s Online Grocery Pickup. 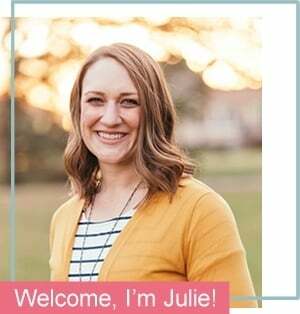 It’s honestly one of my favorite tools for surviving motherhood! If you don’t use Walmart’s Online Grocery Pickup, you can easily locate this product with the packaged lunch meat in the perimeter coolers. How do you make ham and cheese sliders in the oven? The first step to making this sliders recipe is to preheat your oven to 350 degrees F.
Then you will want to grease a 9×9 or 9×13-inch pan. After that, slice the sliders buns horizontally and arrange in the bottom of the baking dish. You will want to slice them as a “slab” and not pull them apart into individual buns because you want them to be connected. Then layer half the ham on the rolls, top with the Swiss cheese and then the rest of the ham. 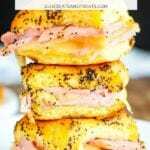 Finish by laying the top “slab” of buns on top of the ham and cheese. 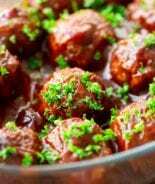 Grab a small bowl and combine your melted butter, honey mustard, dried minced onions and Worcestershire sauce. Whisk this mixture to combine. After the butter mixture is combined, pour the mixture evenly over the rolls, and use a silicone brush to evenly distribute over the tops of the buns. Cover the pan with aluminum foil and let buns set for 5 minutes. After that, place the pan in your pre-heated oven and baked, covered, for 20 minutes or until heated through and cheese is melted. Remove the pan from the oven, take off the aluminum foil, and put back in the oven. Cook in oven for an additional 3-5 minutes or until tops are slightly golden brown. Take buns out of oven, slice into individual sliders and enjoy! Be sure to give this recipe a try! If you love this sliders recipe as much as we do (pretty sure you will! ), be sure to leave a five star rating below! 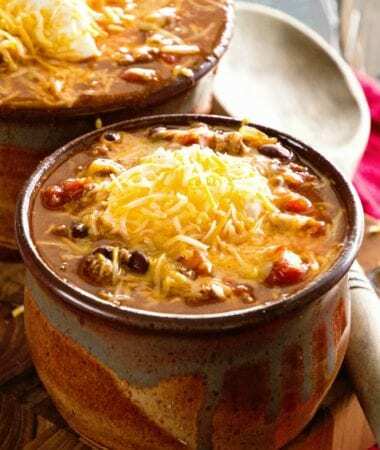 Quick and easy tailgating or dinner recipe! 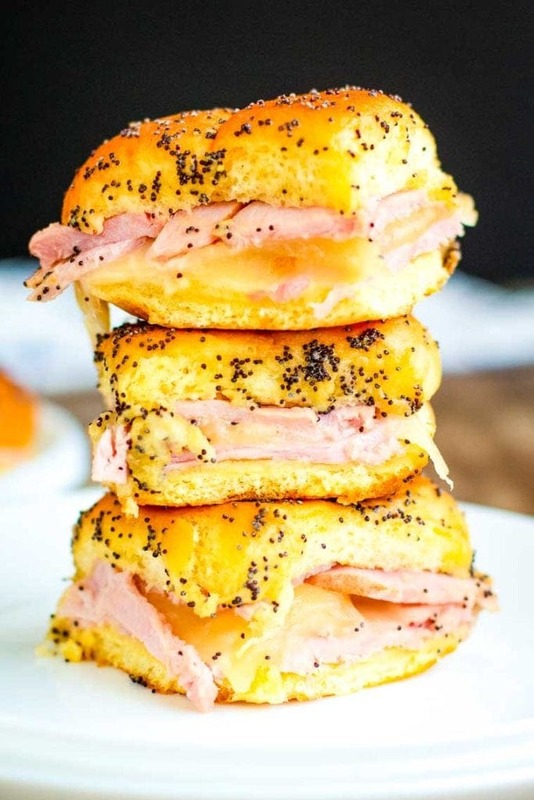 These ham and cheese sliders are perfect for a quick appetizer for parties or as dinner. 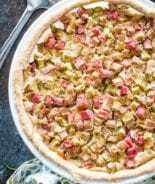 Loaded with flavor from the ham, cheese and buttery poppy seed topping! Slice slider buns horizontally and arrange the bottom of the buns in baking dish. Slice them as a "slab" do not pull them apart in individual buns because you want to keep them connected. Layer 1/2 the ham on the rolls, top with cheese and then the rest of the ham. Top with the top "slab" of buns. In a bowl combine melted butter, honey mustard, dried minced onions and Worcestershire sauce. Whisk to combine. Evenly and slowly pour the mixture over the rolls. 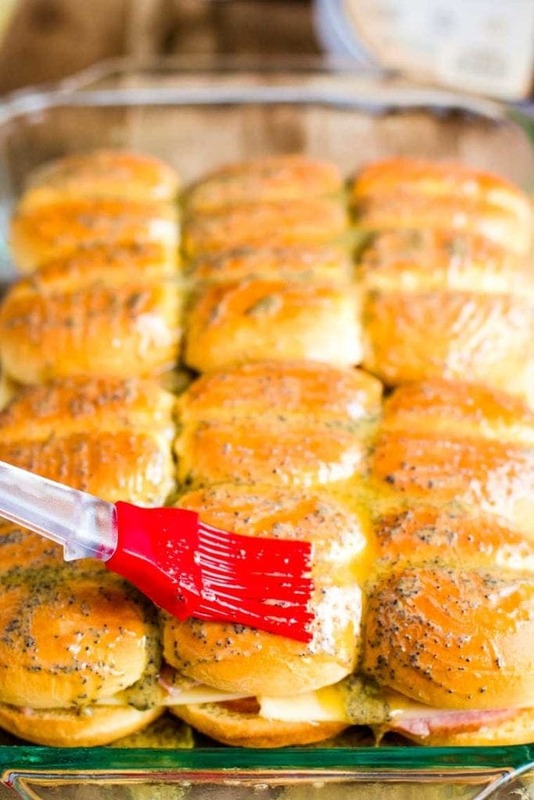 Use a silicone brush to evenly distribute over the tops of the buns. Cover pan with aluminum foil. Let buns stand for 5 minutes. Then place in preheated oven and bake covered for 20 minutes or until heated through and cheese is melted. Remove from oven, take aluminum foil off and put back in oven. Cook for an additional 3-5 minutes or until cooked to desired doneness. Remove from oven, slice into individual sliders and enjoy immediately. The poppy seeds and onion sauce for the top just takes these to the next level of delicious! Yes! It’s a must have on top of these delicious sliders! I have never made sliders. Can you believe it? What is wrong with me? I feel practically un-American. I’m going to have to whip some of these up right away! This is my favorite party recipe! I even make it for dinner sometimes because it’s so easy. These are hands down one of our favorite snacks! Can’t be a staple like this recipe! It doesn’t get better than these sliders!! 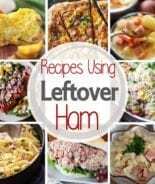 I love making extra for leftovers the next day! !